"Click here!" says the button--and your site visitors either do, or they don't. As a Web designer or marketer, your job is to do everything you can to get users to click a button, download a file, submit a form--in Internet marketingspeak, convert. Part of the appeal comes down to polished aesthetics, and the $27 ShoutDesigner program (with limited demo) can help you create beautiful, compelling action buttons that just beg to be clicked. ShoutDesigner offers many beautiful designs for buttons, but no easy way to browse them all. ShoutDesigner runs on Windows, but was created to resemble a Mac OS X application, with window-control buttons on the left side. This look makes it stand out on a Windows desktop, but not necessarily in a good way. Designing a new button is a six-step process. In step one, you pick a style. ShoutDesigner's free version comes with 100 styles, while the commercial edition provides over 200 button styles. Despite the program's wealth of designs, its awkward browser merely allows you to scroll through them one by one, which makes for uncomfortable viewing. If you spot a button you like but want to browse on, you have no way to mark it and return to it later--you'll just have to remember it and scroll all the way back to it. Once you do settle on a style, you may be inclined to click the inviting Next button. Don't, because clicking Next prompts ShoutDesigner to forget the currently displayed button and send you to step 2 with the default button (the first one the browser shows). To use the button style you prefer, you must click the button style itself, not the Next button. Confusing. Step two is simple enough: You select a size for your button, and see a nice preview. In step three you choose a color; ShoutDesigner gracefully handles color gradients, so your button looks attractive in just about any color. Step four concerns the label ("Click Here," "Buy Now," and so on). In step five, you choose an icon to appear on your button next to the label. Careful--the software provides no way to undo the icon selection. If you pick an icon and then decide that you don't want an icon next to the button wording after all, you have to go back to the beginning of the ShoutDesigner process. Step six is about selecting effects, such as a glow or shadow. Finally, ShoutDesigner allows you to export your button either as a static image or as a set of three images with some CSS and HTML. I strongly recommend taking the static-image route: The CSS that ShoutDesigner exports contains arbitrary defaults (why float the button left?) and invalid values such as "font-style: null." If you manage to forgive its interface flaws, ShoutDesigner can be a convenient tool for budding designers. The buttons do look nice, and as long as you use just the image itself, you can produce a very clickable button in ShoutDesigner. 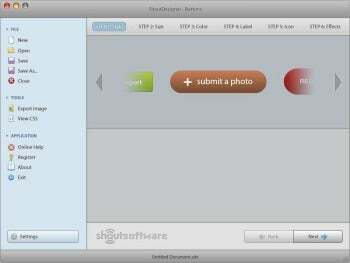 Through the simple Web design utility ShoutDesigner, you can create call-to-action buttons.